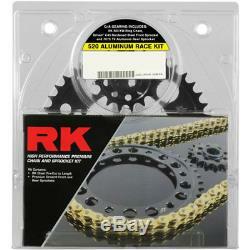 RK XSO RX-Ring 520 Conversion Race Chain/Sprocket Kit (15/45). 520 RACE CHAIN & SPROCKET KIT. The 520XSO chains features RK's proprietary "RX-Ring" seal design. Viewed in cross-section, the RK "RX-Ring" has two lubrication pools and seal points versus the single seal point/pool design of a regular o-ring chain. RK's XSO chains offer quality, performance and unbeatable value, for all but the most demanding high performance application. RKs 520 Race kits feature pre-cut RK premium, lightweight RX-Ring sealed racing chain. Tensile Strength: 8,500 lbs. Master Link Included: Rivet Type. Kits include a premium Driven® 7075 T6511 lightweight Aluminum black hard anodized rear sprocket paired with Driven® C45 steel case hardened and quenched front sprockets. RKs 520 Race Kits combine the enhanced performance of race gearing and lightweight aluminum rear sprockets to reduce rotating mass. Kit includes a one-tooth-smaller-than-OE front sprocket and two-tooth-larger-than-OE rear sprocket. 2011 - 2015 Suzuki GSX-R600. NEW in original retail package. We are an authorized RK dealer. All items in our store are 100% BRAND NEW and genuine. All tags must be attached, retail packaging must be sealed and in brand new condition, and item must not have been worn, used or installed. The item "RK XSO RX-Ring 520 Conversion Race Chain/Sprocket Kit (15/45) Gold 3066-118DG" is in sale since Saturday, November 4, 2017. This item is in the category "eBay Motors\Parts & Accessories\Motorcycle Parts\Drivetrain & Transmission\Chains, Sprockets & Parts".